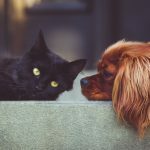 Do you live with both cats and dogs? If so, you may sometimes feel that it’s raining cats and dogs inside your home–literally! Some dogs love making friends with kitties. But some may not, and we all know that felines can be picky about their companions. Luckily, you don’t have to give up Fido or Mittens in order to make things work. There are ways to improve the cat and dog relationship in your home. Keep reading for some great tips. Both dogs and cats can be trained. But let’s be real: dogs are far easier to train than cats. What’s more, dogs may even require foundational training, especially if they are newly adopted or fresh from a litter. If your cat and dog are really having relationship problems, consider how much of this is the result of your dog’s behavior. Does your dog dash across the room when your cat saunters in, for example? Or is your cat the one doing the provoking? 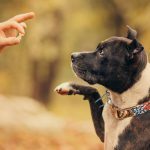 If your dog is frequently the culprit, work on training him to sit and stay on command. Most importantly, work on minimizing his tendency to leap up, run away when called, or stick his nose in your kitty’s business. Some dog owners are wary of taking on this training themselves. You can always seek out a professional dog trainer or enroll your puppy in a training course. Cats love having their own spaces. They particularly love having their own private, contained spaces–hence the plethora of YouTube videos out there showing cats crawling into boxes! Make sure your cat has its own territory, one that your dog never enters. This may be a closet or a cordoned-off portion of your living room. Fill this space with items your cat is likely to appreciate, too. These may be a series of cat toys, like scratch towers and balls of string. Dark, cozy places for your kitty to retreat are also helpful. A cardboard box will do in a pinch. In fact, to make things even easier, try to create these safe zones for your cat throughout the house. Train your dog not to enter these spaces at all costs. This can ensure that your cat feels independent and unprovoked. Your kitty can also always retreat to these spaces if it feels threatened at any time. It’s important for your cat and dog to feel familiar with each other’s smells and habits. Do your best to encourage familiarity between the two in this respect. You can do this, for example, by letting your dog sniff your cat’s toys or sleeping pad. This may minimize your dog’s need to get up close and personal with your kitty when she walks into the room. The same goes, however, for your cat. Allow your cat to sniff and explore your dog’s toys regularly. This is a particularly important step if you are introducing your cat and dog for the first time. Cats really prioritize their personal space, but they are extra private when it comes to doing their business. Most cats like being on their own when they are using their litter box. For this reason, keep your cat’s litter box out of range of your dog’s nose (and teeth!). This will enable your kitty to do her business privately. It can also prevent the icky situation of your dog munching on cat feces, which has happened before. This can put your dog at risk for all kinds of illness. And it can be particularly offensive to your cat! Struggling to find an out-of-the-way place for your cat’s litter box? Remember that cats can jump up to high places quite easily. You may want to elevate your cat’s litter box in the garage, for example. You can also place the litter box in a room accessible only by a kitty door. Once again, it’s vital to give your dog and cat their separate, private places. Establish separate meal times and places. This means choosing different areas for your cat and dog to enjoy their daily meals. 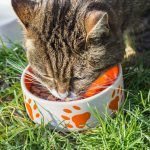 If your cat prefers eating in a certain manner–i.e., on top of a counter or outside–make sure you honor this preference. Some pet owners feel content letting their cat and dog drink out of the same water bowl. However, even water should be administered separately to your pets. In extreme cases, choose different times of day that you feed your pets. 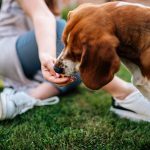 This can ensure that your dog doesn’t munch your kitty’s nibbles (and vice versa). 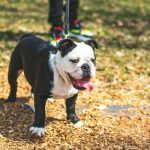 Make sure your dog is getting the exercise he or she needs to stay happy and healthy. Frequent exercise can also minimize the risk of pet bickering later on. This is particularly important if you have a high-energy dog and a shy cat. In general, your dog should get five minutes of exercise per month of age. So, for example, if your dog is 20 months old, he should be getting at least 100 minutes (almost two hours) of solid exercise daily. Mature dogs can, obviously, roam for much longer. If you simply don’t have the time to get your dog’s energy out, consider hiring a dog walker. Are you still a single animal owner merely musing on having both cats and dogs? If so, make this decision wisely, and keep personalities in mind when you do so. Breeds may impact the cat and dog relationship in your home. But personalities are what ultimately determine compatibility. A teacup Yorkie, for example, is not necessarily going to like your long-haired cat better than a Labradoodle. Learn more here. Before you bring a new puppy or kitty home, do your research wisely. Visit potential animals ahead of time. Reflect on the personality of your current animal as you do so, and recognize how your pet responds to other cats and dogs. Once you do bring a new animal home, plan that introductory meeting between the two mindfully. Always have a backup plan if there seems to be a personality clash, and especially if the tips on this list aren’t fruitful. Yes, it is possible to create a healthy cat and dog relationship in your home. Be mindful of each animal’s individual personality and needs in order to do so. But it’s also vital to understand cat and dog behavior. Here at Cat Health & Behavior, we’ve got you covered from the feline side of things. Check out this post on general cat behavior to learn more!